You know that energy that’s in the air when a new school year starts? Use it for productivity! Now’s a great time to organize with the spirit of new beginnings in the air and all of the ambition that comes along with a new school year. You know that come spring, we will all be dreaming of lazy days by the pool and little will get done. While the kids are away, its the perfect time to get to work on their stuff. I started my fall cleaning with sorting through clothes and toys for baby items no longer needed & outgrown clothes. With 2 kids so close in age, clothes move directly from one closet to another. After Cora’s closet, they are marked for passing down, donating, or keeping. It’s easiest to keep an un-cluttered home clean. The less you have, the less you have to pick up! I find that it takes a regular effort to keep up with de-cluttering and it’s best to break it up task-by-task. For us, right now, it makes sense to organize for the school year and let go of the things that our growing girls no longer need. 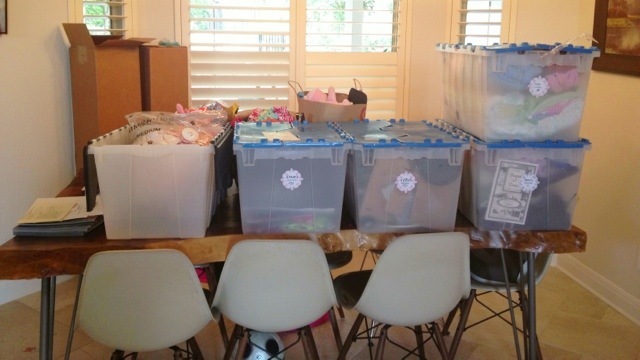 Here’s how we tackled our first fall organization & cleaning project. Enter one of my favorite organizational tools… the trusty tub. Great for storage. I like the style with the flat, hinged lids so they don’t collapse or disappear and can be stacked. 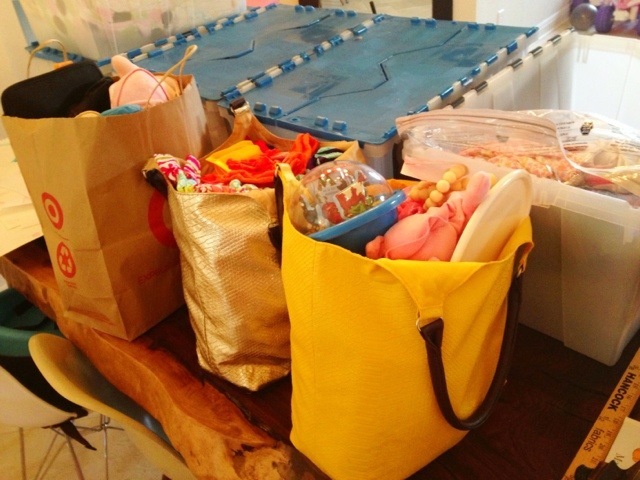 We were passing clothing & baby items on to another family and used bags for the items set aside for them. We’ve also had a box designated for “goodwill” since moving that we are still filling regularly, just at a slower pace now. Items in good condition to be passed down were organized into categories like toys, clothing, baby gear and put into bags. Some clothing items are keepsakes that were mine or even my mother or grandmothers, so these items were placed into spacebags and then into a tub for preservation & storage. There are always those keepsake items that happen into your life randomly. We photograph every day art projects, save a copy in iPhoto, and upload a copy to Artkive, but there are always those special art projects, items for scrapbooks & baby books, and special mementos that need a home. Each child got a tub for these items and I designated one for myself as well for the assorted small boxes of my personal mementos that were floating around the house. Somehow, Jason didn’t need one. He prides himself on not hanging on to these things, but let’s face it, it’s probably all at his mother’s house somewhere ;-). That left me with 4 tubs so I created pretty labels for each one. These labels were left over from another project and are from Whisker Graphics, but you should be able to find something similar at any office supply or craft store. All I did to give them that extra touch was to use styled letters for their names and include a little drawing. It looks much harder than it was. The design of the labels does most of the work. 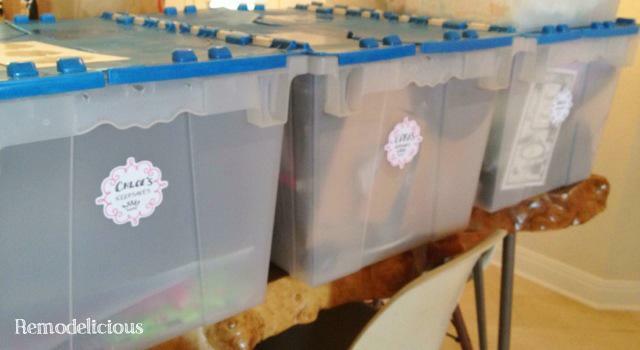 The girls’ keepsake tubs need to be handy to place those items in when they happen, so for us it made sense to put them just as you walk-in to our tiny walk-in attic. We also considered our larger attic (no quick access, pull-down stairs) or our garage (so much dust and chaos). The baby clothes and my keepsakes can be more tucked away. It was a pretty painless organization project and now we can better tackle organizing the toys they actually play with and the art supplies that are now part of our lives. The keep to keeping anything organized it to make it simple and easy. Next time the girls have a cherished keepsake, we can just pop it in their tub instead of looking for a safe spot. If ever a grand organizational idea doesn’t work out as planned, it’s time to re-think it (we are currently having this with our first-aid/medicine cabinet). I believe in organized cabinets, drawers, and closets because they make keeping organized easy, but more on that another time. It’s refreshing to upload the extra weight in your house/life and it feels great to know that our items are going to another family to get a second life (or 3rd/4th for some hand-me-downs & second-hand purchases).